Edit a configuration profile. After making changes, deploy the new configuration to the cluster, datacenter, or node by running a configuration job. Click the edit icon for the config profile you want to edit. In the Config Profile pane, select the configuration file to make changes to. The available configuration options appear for the selected configuration file. When you are done with editing the config profile, click Save to save configuration changes, or Cancel to cancel. 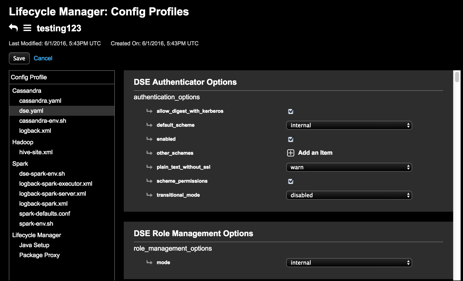 Run a configuration job to apply the config profile changes.